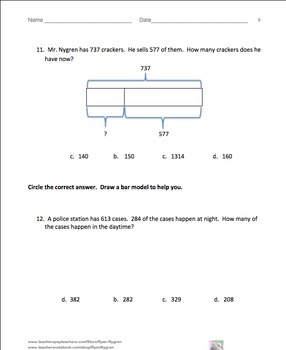 Singapore 2nd Grade Chapter 4 Math Test Review (13 pages). 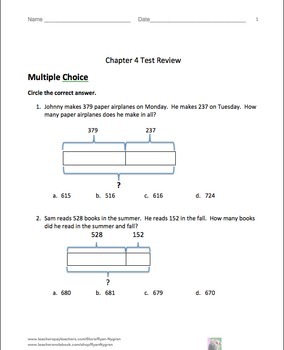 This is a test review for the Singapore program in math. It is for the second grade's Chapter 4. The problems are very similar to the ones on the test, just the numbers and wording have changed. For each problem on the test, there are two or three practice problems. There are 13 pages. It can also be used as an assessment, extra practice, or homework. If you need any assistance, please email me at r_nyg@yahoo.com If you find any errors AND email me letting me know, I will send you 2 of any of my non-bundle products for free. Check out the other chapter reviews for 2nd grade. 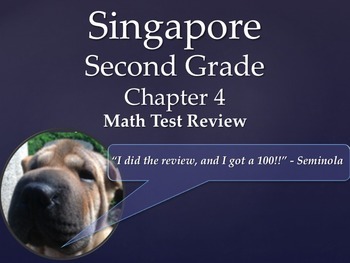 Here are some links to other grades' math reviews for Singapore. All the Singapore reviews can be found on this Pinterest Page.